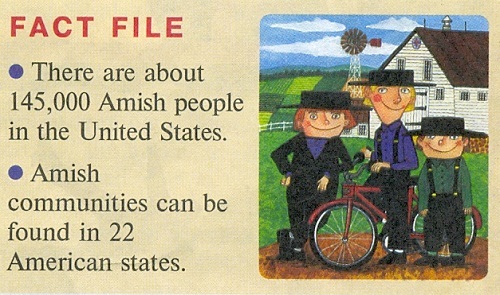 Amish people. Walking into an Amish community is like going back in time. 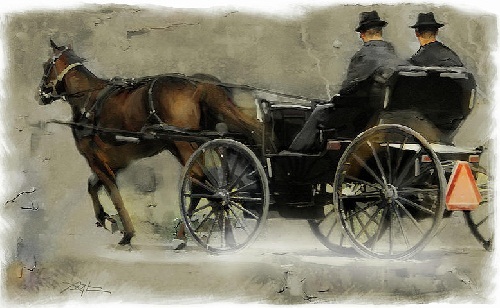 You’ll see girls in long dresses, horses, pulling buggies, and homes lit by kerosene lamps. 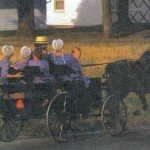 There are about 145,000 Amish people in the United States. 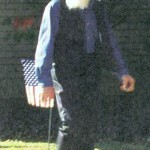 Amish people can be found in 22 American States. In Amish communities, many modern things, like TVs and computers, are nowhere to be seen. That’s because Amish people live by a set of beliefs that’s more than a religion – it’s a simple way of life centered around faith and family. 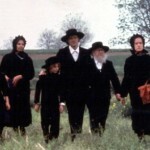 They even speak a language called Pennsylvania Dutch, or Amish, which sounds like German. 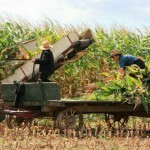 Most Amish families make their living by farming, and they won’t let technology into their barn or home. Amish families follow a strict Christian religion that stresses the importance of keeping oneself separate from the modern world. They keep electricity out of their homes, for example, because they don’t want TVs, radios, computers, and other modern gadgets to change their simple way of life. Their religion also stresses that the needs of others are more important than your own. Giving up my will and way. 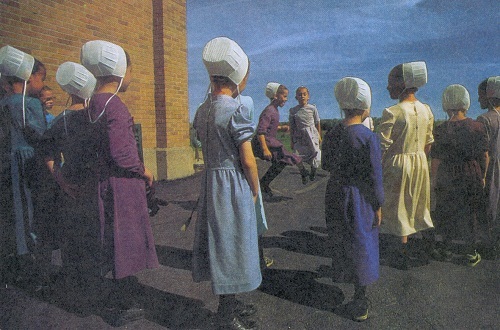 Amish women and girls wear plain dresses because patterned clothes are considered immodest. 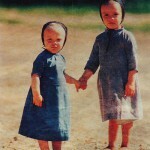 Amish women and girls wear plain dresses because patterned clothes are considered immodest. They also wear aprons and bonnets as a sign of their respect for God. 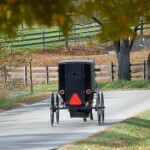 If an Amish woman is married, she wears a black bonnet. If she is single, she wears a white one. And they never wear jewelry or make-up. 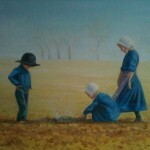 Amish girls never cut their hair, so brushing it is a job in itself. They wear their hair in a bun on the back of the head and cover it with a bonnet. 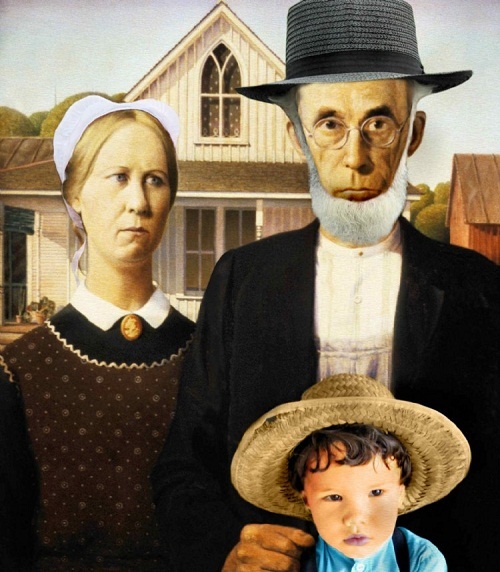 Though the children speak Amish at home, they are expected to use English at school. Their schooling is like most American kids’. 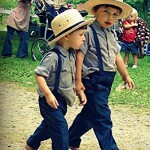 But there’s one big difference: Amish children go to school only eight years. That’s because Amish parents say too much education makes children too “worldly”, or sophisticated. And they should be honest, simple and true. Amish boys and girls go to public schools where the students are all Amish. The teachers are non-Amish, or, as the Amish call them, English. Belts, sweaters, ties and gloves are forbidden. They do not have moustaches, but they grow beards after they get married. 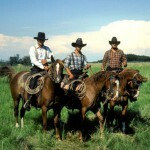 Men and boys wear dark-colored suits, plain shirts, suspenders and black or straw broad-brimmed hats.